Big data alone does not guarantee better business decisions. Often that data needs to be moved and transformed so Insight Platforms can discern useful business intelligence. 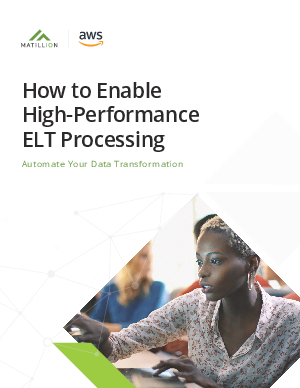 To deliver those results faster than traditional Extract, Transform, and Load (ETL) technologies, use Matillion ETL for Amazon Redshift. This cloud- native ETL/ELT offering, built specifically for Amazon Redshift, simplifies the process of loading and transforming data and can help reduce your development time. This white paper will focus on approaches that can help you maximize your investment in Amazon Redshift. Learn how the scalable, cloud- native architecture and fast, secure integrations can benefit your organization, and discover ways this cost- effective solution is designed with cloud computing in mind. In addition, we will explore how Matillion ETL and Amazon Redshift make it possible for you to automate data transformation directly in the data warehouse to deliver analytics and business intelligence (BI) insights that meet your business needs.